What is rendering? You may know the answer very well. May be you did several renders before. It may be photorealistic, animation or architectural rendering or visualization. 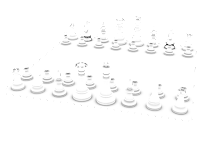 But you need to consider the ambient occlusion also. Whether you are using Autodesk Maya or any other 3d software, ambient occlusion will add depth to your renders. In this tutorial you will learn two techniques to add ambient occlusion to your final renders. Please note that this tutorial will cover only the render pass, not the compositing part. If you need a compositing portion please drop a comment. For those who don’t want to see a YouTube streaming video/ or don’t have accesses to the high speed inter net I am adding a text version also. Please go through the steps. 1. Prepare you scene first. Add materials and lighting. 2. Add render settings properly. 3. Select all the geometry in the scene excluding lights, particles and other non-render able objects. Create a new render layer and add selected geometries to that layer. 6. Click the preset tab in AO attribute and chose Occlusion. 7. This will create a surface shader and a mib amb occlusion shader. And also automatically adjust mental ray settings for the occlusion pass. 8. Click on the mib amb occlusion tab and adjust the parameters. 9. Before adjusting the parameters you can do a test render first. Render the current frame and check how much noise is coming and how bright the render is. 10. If too much noise is coming, increase the samples to 32 from 16. This will reduce the noise. A value of 64 will give satisfactory result. A value of 100 will give a better result without any noticeable noise. But this will increase the render time. If you have a good rendering service such as studio rendering or render farm this won’t be a big problem. But you are on a personal computer and want to render out a big scene with occlusion!!! 11. Now we need to adjust the spread black colour i.e. the occlusion. Click on the max distance and adjust the value as necessary. You can start from 1. According to my scene scale 1 value of 5 give the satisfactory result. The value may vary according to the scene scale. A value 1 represents 1 Maya grid unit. 12. Save the scene and do a batch render and composite in your favourite post production software. 1. Change the renderer to Mental Ray. 3. Change the layer name to beauty. 5. Repeat the steps from 8 to 12 from the above procedure.